Quantum Biofeedback communicates with the body to determine what energy imbalances are most affecting personal health: physical, mental and emotional concerns. Science has shown us that the body is indeed electric; therefore electrical reactivity in the body can be measured. The sensitivity is set so finely that it picks up the earliest signs of distress. The information is then prioritized to help the practitioner zero in on the body’s correct specific needs. For best results, a highly trained practitioner needs to evaluate these readings. By analyzing recurring patterns, he/she will be able to give information about issues which may be below conscious recognition, such as mental and emotional stresses, nutritional suggestions, food sensitivities, digestive and elimination needs, etc. Treatment is then similar to peeling an onion; each session will work with the outermost layer. The Quantum Biofeedback device applies the appropriate frequencies to help correct the imbalances and allow the body to shift gears into a state of greater health and vitality. Quantum Biofeedback assists in reconnecting clients to their own inner knowing; revealing their innate wisdom to assist in identifying where to make lifestyle changes and which specific stress reactions to manage. The human body does not come with an instructions manual, however, Quantum Biofeedback can provide the clues necessary to create self-directed control, vitality and thriving. 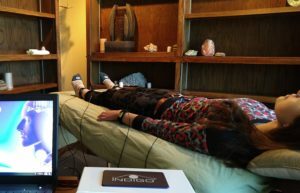 Biofeedback provides the client and health professional with an excellent tool to help balance mind, body and spirit, as they are interrelated, and allows the body to heal naturally. It could be perfectly used as a complement to other integrative therapeutic modalities such as chiropractic, acupuncture, detoxification or nutritional supplementation. What Can Quantum Biofeedback Do For Me? Identify and remove the cause of stress. The client must be prepared to take responsibility for his/her illness. Clear blockages to flow of energy in the body. Reduce symptoms with natural methods. Correct constitutional make-up or tendencies of the client. How Can Quantum Biofeedback Help Me Handle Stress? Stress is created by any upset to our body’s equilibrium. It can come from a wide variety of sources, including: deadlines, pressure, excess stimulation, lack of sleep, lack of exercise or nutrition, emotional trauma, physical injuries, infections and much more. National Institute of Health research indicates that stress plays a role in at least 87% of all illness. Are you tired of being tired? Of being told you are imagining it? That it is all in your head? Are you willing to invest two hours to learn what your body is trying to tell you? Debora Cantel, D.C., L.Ac graduated from Palmer College of Chiropractic in 1991 and has been a PA licensed acupuncturist since 2002. She and her husband, Dr. Chris Meister are co-owners of Asian Institute of Healing Arts in Mount Pocono which offers a variety of healing modalities including chiropractic, acupuncture, massage, nutritional counseling, Indigo and Life Systems biofeedback, tai chi and Kung Fu. They have been serving clients in Northeast Pennsylvania for almost 30 years. Dr. Cantel has been practicing Quantum Biofeedback utilizing the Indigo Biofeedback system since 2017. Kristy Policastro, HHP, CBT is a Holistic Healthcare Practitioner and Certified Life System Biofeedback Technician. Ms. Policastro is a graduate of Keystone College earning a Bachelor of Science degree with a background in Human Services, Psychology and Early Childhood Education. She has been certified by the College of International Holistic Studies as a Biofeedback Practitioner and holds additional certifications in Aromatherapy, Bach Remedies, Energy Healing and Detoxification from the Holistic Arts Institute. Having a daughter with Down Syndrome, she is dedicated to helping those with special needs. She has been seeing clients professionally since 2014 and considers her work a labor of love.